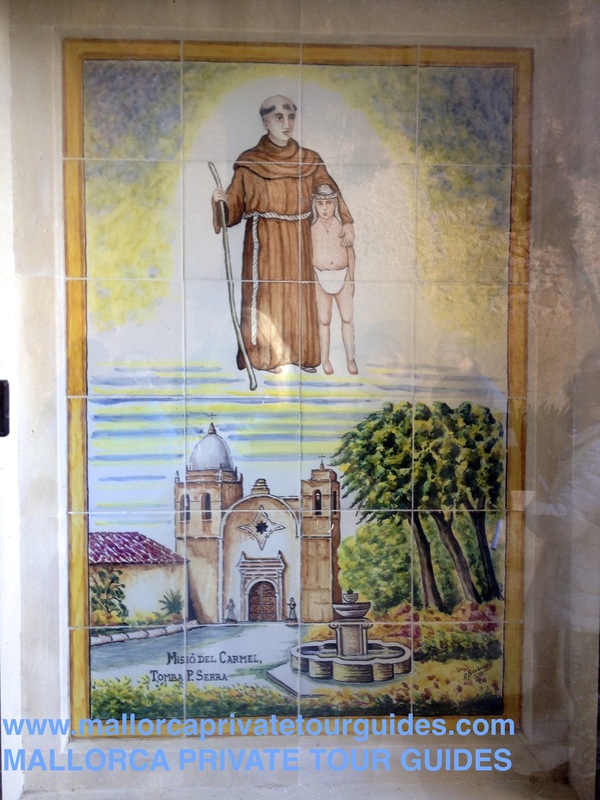 August 28th 1784,died at Mission San Carlos Borromeo , located next to Carmel river, near Monterey, our most illustrious Franciscan, Father Junipero Serra the founder of California´s missions. 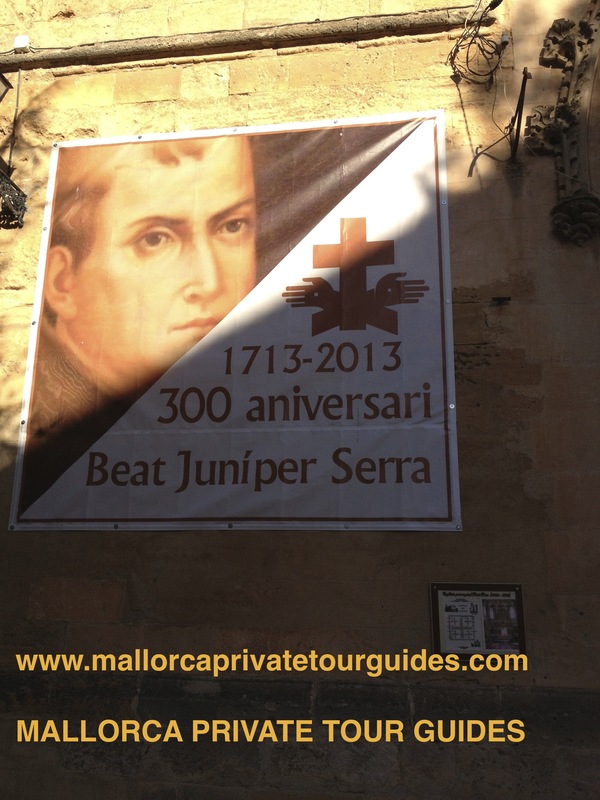 Many are the events that have been organized this year in Mallorca, declared Juniperian year, to commemorated the figure of our most international Franciscan, blessed Father Junipero Serra. Mallorca has been visited by several members of the various Serra clubs distributed by different countries over the world during the “Serra Convention “ held this summer in our island. At last, finally is coming true the deserved recognition to this figure of Father Serra ,without him it would be impossible to understand the foundation of the Californian missions, on the mission trail ,and the foundation of the Golden state “California” in USA. Within the lack of knowledge about his figure and history, sure for many is one unknown the origin of its name, JUNIPERO, many majorcan are even surprised, this name is not very majorcan, and so is …. Our Father Serra was Christened in Petra, his hometown with the name Miguel Jose Serra Ferrer, which is the why of his name change? … for sure it is unknown for many people. Mallorca Private Tour guides wants to shed some light on this matter and help you to discover the reason why Junipero´s name…. At the age of 15 years, the young Miguel Jose Serra began attending philosophy classes at Sint Francis convent in Palma and there awakes his religious vocation and he is called to join the Franciscans, September 15th, 1731 issues his religious vows at Convent of Jesus and adopts the Franciscan habit which will accompany him to the end of his life, becoming undoubtedly our most international Franciscan, blessed Father Serra. So September 15, 1731 is when he left behind his old name Miguel Jose Serra to adopt his new name JUNIPERO SERRA. The reason the great devotion that our Father Serra processed the figure of St. Francis of Assisi, the founder of the Franciscan order. Among the Franciscans who accompanied St. Francis of Assisi in the foundation of the Franciscan order, the figure of one of its most fervent followers “Junipero of Assisi” who went down in history as the “jester” (joculator domini) and Santa Clara (founder of the Poor Clares) describes him as the Minstrel of God, and she asked him to accompany her in the header of her deathbed. Such was his insistence, perseverance and determination in everything that Junipero of Assisi made that St Francis get to coin the phrase “Whoever gave me a forest of these juniper trees” we can not forget that the name Junipero comes from the Italian word “Ginepro” which means juniper tree , botanical name “Juniperus” which is a very resistant pine species. We asume it is a clear allusion to the strong and persevering character of the most ardent devotee of St. Francis of Assisi, Junipero of Assisi, a person full of patience, a person full of kindness, very sensitive to the suffering of others, and first and foremost a devoted Franciscan. To give us insight into the qualities of Junipero of Assisi, an anecdote that perfectly describes his personality. The legend tells; Junipero of Assisi went to visit a sick friar, who asked him to bring a leg of pork, feeling sorry by the por sick friar, Junipero sensitized with his suffering, would fulfill his wish and look and look until he found a herd of pigs in the field, so he grabbed a knife and cut the leg of one of the pigs and bring it to the sick monk, making his wish to come true. But the swineherd, who saw what happened, went to tell his master what Junipero made, and the animal´s owner very angry went to talk to St Francis in order to tell him to rebuke his disciple for his attitude. St. Francis called to his presence to Junipero, and rebukes him severely for his attitude and tells him to apologize to the owner of the animal for its action. Junipero agrees to the request of St. Francis and he went to apologize to the pig´s owner, and tries to explain him the reason for his action, which is to relieve the suffering of a sick monk, whereupon the angry men becomes even more angry and angrily rebukes him again for his action. But Junipero of Asisis, famous for his persistence, don´t let himself to be influenced by the angry man, and continues to insist in its history, and even he suggested to the owner of the herd,to kill a pig and give it to the monks, such was his insistence, perseverance and humility of Junipero of Assis that he just convinced the angry man to do it, and finally the herd´s owner was apologizing to Junipero because of his anger and even gave a pig to the friars. That is why St. Francis coined the phrase “Whoever gave me a forest of these juniper trees” as it was sure that among his followers he had not anyone so insistent and persistent that could subdue most obstinated and renegade people as the “minstrel of God” ,his most Junipero ardent devotee Junipero of Assisi. Discover with Mallorca Private Tour Guides this and many more stories about our most universal Franciscan, Father Junipero Serra. Visit with our professional Tour guides Petra, the birthplace and origin of California state, the birthplace of Father Serra, a guided tour to his hometown to discover the parish church where he was baptized, the monastery of San Bernardino, the museum in his honor, the monument to father Serra, and the square which bears his name …..
Let us guide you through the story of Father Serra, discover the history of the founder of California´s missions, its people, its origins and the island where he was born and always took with him in his heart and in his mind. From Mallorca Private Tour guides will encourage all of you to discover his hometown Petra, and why not a meal at one of the most famous cellar to enjoy sthe great majorcan cuisine, along with a wine tasting of the famous wines that are produced in the winery of Petra Miquel Oliver or a walk through its vineyards.